We all have them…and we’re always fighting with them, to keep them short & stout, weed-free and just the right color. They consume our time, money, energy & water, and in return, they provide us with noise, air & water pollution. They contribute to droughts and flooding. Maintaining them also degrades many things: the environment, critical habitat for beneficial insects, birds & other animals, and our very own health. So what are these terrible things?… Our lawns! Why do we have to fight with them so? The simple answer is because they don’t belong here. Most lawn grasses are not native and do MUCH more harm than good. Why would we invest in something so detrimental to our lives and the lives of other living creatures? Simply put, it’s out of habit and familiarity. Hopefully after reading this series of posts, you’ll never look at a lush lawn the same way. Lawns now consume over 50 million acres across the United States. Wherever we develop the land, we tend to remove the natural landscape that serves many ecological functions, and then replace it with unnatural lawns that do just the opposite. In each post, I’ll talk about a major issue with lawns and offer some solutions. Because of their relatively short roots, lawn grasses need immense amounts of water to stay green. 60 % of the water used on the West Coast is used to maintain lawns, despite water shortages (It’s 30% on the East Coast). A 1000 square foot lawn requires about 10,000 gallons of water per year to look good! SOLUTIONS: Reduce the size of your lawn by adding planted areas, such as flower beds, woodlands, meadows, xeriscaping, etc. 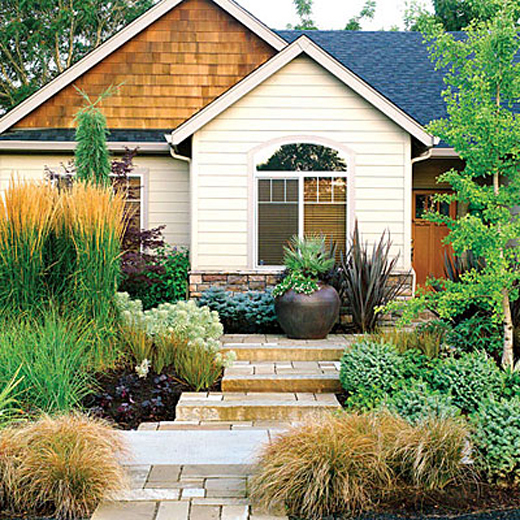 The roots of native perennials and grasses run deep so they need little water once established. Learn more from my previous post on native plants. Lawns are almost as impervious as paved surfaces like roads, parking lots, driveways, sidewalks, patios and roofs. This means that when it rains, the water runs off these surfaces instead of sinking into the ground where it can replenish underground aquifers. The effect is two-fold: drought and flooding. For every square foot of impervious surface, we increase stormwater runoff by almost 36″ per year! The runoff ends up in our waterways, carrying with it all sorts of pollutants along the way, which causes numerous harmful effects. SOLUTIONS: Reduce impervious surfaces on your property and replace lawn with rain gardens and add trees (the leaves of trees hold onto water, where it evaporates or slowly drips off onto the ground). Hook up a couple of rain barrels to your gutters to capture & store water running off your roof, then water your plants and remaining lawn areas with it. Replace old patios or driveways with porous surfaces. See my top 5 ways to resolve driveway dilemmas here and create porous garden paths here. Opt for a green roof for your shed, home or business, as there are numerous benefits in addition to stormwater management. See Part II of the Turf Wars post here and learn how lawns are detrimental to birds, why this matters, and what simple things you can do about it.